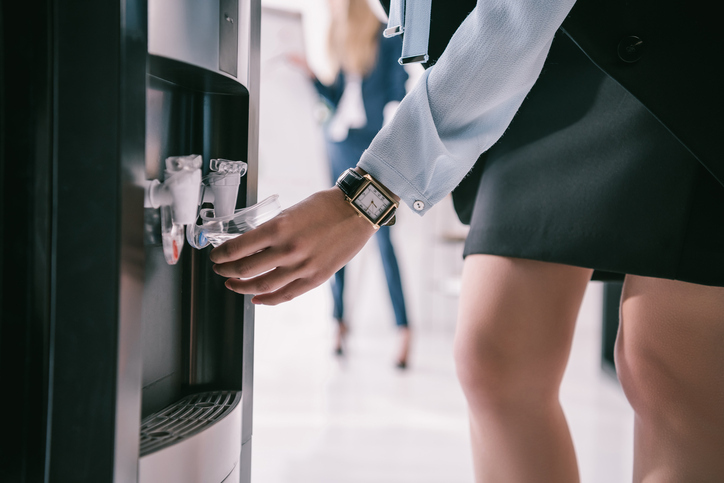 With stale, recirculated air, many hours spent seated, and a surplus of free coffee in the office kitchen, it’s no wonder dehydration is a problem in the workplace. A recent Quench study found that more than three-quarters (77 percent) of those surveyed did not think they consumed enough water on a daily basis to meet their health needs. The national survey of more than 1,000 employed Americans found that the most frequently cited cause for not drinking enough water was lack of thirst (43 percent). However, thirst may not be a reliable sign of dehydration, and often only shows up after one is already parched. Workplace dehydration is a bad thing, as even mild dehydration can have a negative impact on productivity, energy level and alertness – all things needed for a good work day. While how much water you need to drink can vary from person to person, the general recommendation for someone with an average level of activity is eight 8-ounce glasses of water a day (64 ounces). Below are a few suggestions for upping water intake during the day. Find water you like drinking. Don’t like room temp water? Grab ice from the office kitchen or bring a cold thermos stacked with cubes. Don’t like still water? Grab zero-calorie seltzer. Need flavor? There are many brands of low to no-cal flavored waters. Stock up on your favorite. Track your progress. It’s easy to forget how many glasses of water you’ve consumed each day. Keep eight pennies on your desk and move them from one side to the other for each glass. Swap out. If you drink soda or juice during the day, swap at least one drink for water to help boost your progress. Plan. Given concerns raised by employees about not having enough time to get water during the day, review floor plans to ensure that water sources are only a short distance from workspaces. Provide fresh, filtered, great-tasting water that doesn’t run out. Installing bottle-less water coolers that connect directly to the building water supply and filter it at the point of use are a preferred option to large plastic jugs that are not environmentally friendly and must be replaced each time they’re empty or the individual plastic water bottles that are expensive and create such environmental problems that many universities and towns now ban them entirely.